When driving around in Curaçao you will immediately notice all the colorful houses. Some of them are considered Landhuizen, which means Mansions. Landhuizen were built in the 18th and 19th century. Most of them where used as plantation houses for agriculture or salt. Because of their colonial architecture and their mark on the Curaçao sceneries, they are a big part of the cultural heritage of the island. There were about 160 in total, but now around 60 remain intact, some of which you can visit. Each landhuis has its own unique history, purpose and architecture style. We made a short, but diverse list of the most interesting landhuizen you can visit during your vacation. Located on the road to the 2 famous beaches of Kenepa, Landhuis Knip is often seen as their gatekeeper. Landhuis Knip was at one point one of the most prosperous plantations on the island, producing divi-divi seeds and sheep wool. This landhuis has played a significant role in the slave history of Curaçao. Its historical importance is mostly felt as this was the location where the famous slave revolt started in 1795, led by Tula. Currently, it functions as a museum. Call in advance to check their opening hours as they can vary. The Groot Santa Martha mansion is the only Landhuis that was built in the 17th century and was uniquely made in the shape of a 'U'. It is one of the oldest and biggest historic mansions ever made in Curaçao. Until the beginning of the 19th century, it was a sugar plantation and later adjusted to produce pulses, cattle, and salt. In the late 19th century the landhuis produced 90% of Curaçao salt. Landhuis Groot Santa Martha now serves as the home base of the Tayer SosHal foundation. They take care of physically and mentally challenged people. One of the activities includes the production of artwork, available for visitors to buy. Calling in advance is recommended. This landhuis has served many purposes; from a plantation to a residence, to even a boarding school but currently a center for art enthusiasts. It hosts art gallery Alma Blou and a cultural center. It also offers the opportunity to enjoy a cup of coffee on the terrace. It makes for an easy stop as it is Located on the way to Westpunt, right after the Julianabrug. Landhuis Ascencion was built in 1672 and started out as a plantation. Maize, cottons and beans grew successfully, as it is one of the most water rich locations of the island. However, in the early 19th century, the owners of the plantation turned their plantation in a cattle farm. But that didn’t prove successful. Early 20th century, the mansion was home to the politician and writer Cola Debrot, who wrote his novel 'My sister the negress'. Now it serves as a location for events, team building, and a retreat. You can only visit on specific times and days, so make sure you contact them first and make a reservation. 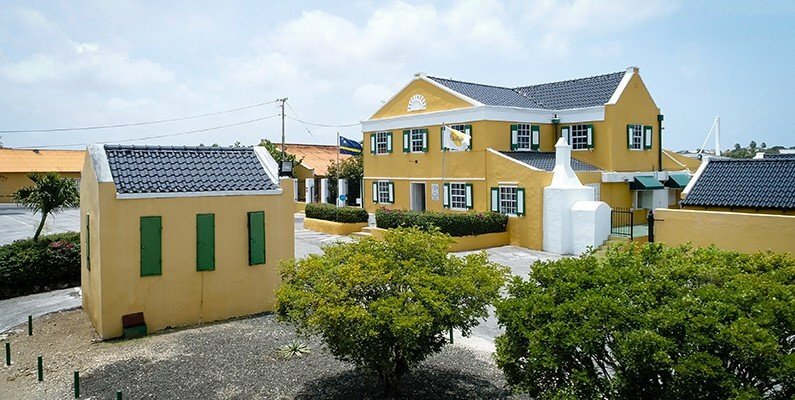 Of course, this list wouldn’t be complete without the ‘Home of the Genuine Curaçao Liqueur’: Landhuis Chobolobo. This landhuis, although located on a salt plain, never served as a plantation. It was mostly a residence until Senior and Co purchased it in 1947 as a location to produce their world famous liqueur. The Blue Curaçao is still produced on its grounds and you can visit the distillery during weekdays. Tours are available. For those that can’t get enough of the Landhuizen, here are more suggestions: Landhuis Daniël, Landhuis Dokterstuin, Landhuis Brakkeput Mei Mei, Landhuis Klein Santa Martha, Landhuis Zeelandia en Landhuis Jan Kok.